Tired and weary Mario keeps traversing to the end of the castle where he sees a sack where the princess should be. But all he sees is Toad telling him that the princess is in another castle. What would you do if you were in that situation? You know Mario lets you know a second later on Level 2. He must have listened to the Apostle Paul.In a letter to the Christian communities in the Roman province of Galatia he tells them to not get tired doing good because if you keep moving forward in the right way you will reap what you sow. It may be an idea that we are all aware of but for many of us it’s hard to follow. Many of us hate school. Primary school is a necessary evil but secondary education is different. However if you want to get yourself in to a career. Something that does not keep you Just Over Broke you have to get to school. It may get tough. You will have sleepless nights. You may even want to quit a few times. Rest assured, if you keep pushing forward you can go from flipping the burgers at the McDonald’s to writing the billing software. You might be out of a job. You have kids at home and not sure how to feed them. You can easily start selling drugs, start stealing, and get yourself piled high with debt. Those may be tough decisions now but as time goes on the decision to do bad would get easier. You will tell yourself that its the only way. But God will reward you if you keep going on the straight and narrow. Imagine that you start doing those very vile things, even if it was for necessity, it would be what your child knows. What your child will see and think its right. You would have raised someone to do something that before your desperation you would have never done yourself. Don’t forget that God will supply all of your needs (Phil 4:19). You just have to believe that everything is happening is his will and that he is doing it for a reason, to mold you in to something better than you were before(Isa 64:8). But we have to persevere and keep doing good to see that come to pass. 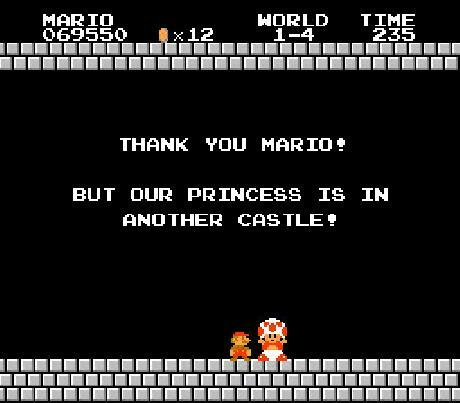 Mario could easily just get frustrated and turn around. All the danger he has to face and to see Toad in place to what he hoped would be the Princess. But Jesus tells us as we know just from experiencing life that we would have trouble. (John 16:33) But if we keep moving forward we can rescue the Princess and get our happily ever after. We can raise our children to have faith and always take the high road. We can get into the career we have always wanted. We can save that marriage instead of complicating it more. We can find promotion in our work place. We can start that business we have always wanted we just have to keep doing the right thing and not stop. As Moses said to Joshua I believe that “the LORD is the one who goes ahead of you; He will be with you. He will not fail you or forsake you. Do not fear or be dismayed.”(Deu 31:8). Let us not become weary in doing good, for we will reap a harvest if we don’t give up. Heavenly Father, life is tough. You said so John 16:33 but you I promise that I will keep doing good because I know that good will come from doing what’s right. Please keep going ahead of me help me to persevere through the trials that I am facing so that I may get the prize at the end. Thank you for never leaving me nor forsaking me in all that I do. In Jesus name, Amen.